Orlando shooter called Boston bombers his "homeboys"
BOSTON - The gunman responsible for an attack at a gay nightclub in Orlando that left 49 people dead called the Boston Marathon bombers his "homeboys" in a 911 call he made during the mass shooting, the FBI said Monday. Harold Shaw, special agent in charge of the FBI's Boston division, said Omar Mateen made the reference to brothers Dzhokhar and Tamerlan Tsarnaev during a 911 call he made early Sunday inside the Pulse nightclub. Despite the reference, Shaw and other authorities have said the investigation has not uncovered any evidence of a relationship between the Tsarnaevs and Mateen. "At this point in time, all evidence collected to date shows no connection between Mateen and the Tsarnaev brothers," Shaw said in a statement. Massachusetts Gov. Charlie Baker said Mateen had previously mentioned the Tsarnaev brothers. "We do know that he raised the Tsarnaev brothers a couple of years ago, and there were a series of interviews and discussions directly with him by federal officials, and they concluded at that point in time that there was no direction between him and them at all," the governor said. What's next in Orlando shooting investigation? Baker did not elaborate. He said he was relaying information Massachusetts officials received during a briefing by federal officials investigating the Orlando shooting. The Tsarnaevs planted two pressure-cooker bombs near the finish line of the marathon on April 15, 2013, killing three people and injuring more than 260. Tamerlan Tsarnaev, 26, was killed during a getaway attempt several days after the bombings. 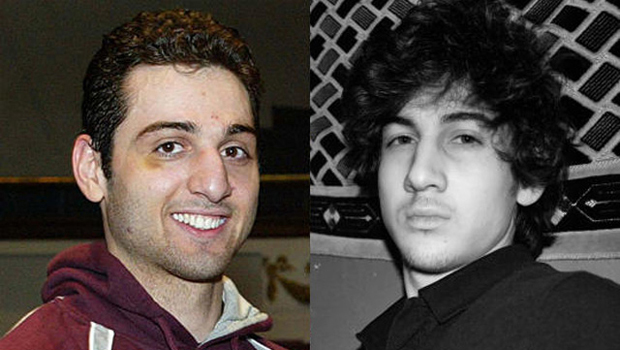 Dzhokhar, then 19, was sentenced to death last year for his role in the bombings. During Dzhokhar Tsarnaev's trial, his lawyers argued Dzhokhar had been heavily influenced by Tamerlan, a former boxer who embraced radical Islam and masterminded the bombings. Prosecutors said the Tsarnaevs, Muslims who lived in the Soviet republic of Kyrgyzstan and Russia before coming to the United States as children, became radicalized in part by reading online extremist materials, including Inspire, an al Qaeda magazine. Mateen, the son of an Afghan immigrant, had "strong indications of radicalization" and was likely inspired by foreign terrorist organizations, FBI Director James Comey said. Authorities said Mateen had twice come to the FBI's attention. Once was by co-workers who expressed concern over statements he'd made about possible ties to terrorist groups, sparking a 10-month investigation. Comey on Monday echoed President Obama's statement that the Orlando shooting was not a foreign-born plot and he also outlined the agency's previous interactions with the shooter. "So far, we see no indication that this was a plot directed from outside the United States and we see no indication that he was part of any kind of network," Comey told reporters. The intelligence community, Comey said, is "highly confident that this killer was radicalized at least in part through the Internet."